The Andover Post Office project received a Performance/Cost Award from the Associated General Contractors of Massachusetts. 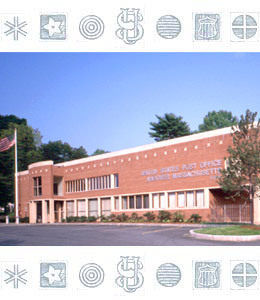 The Andover Post Office responds to two significant design traditions: the Postal Service's tradition of high quality civic architecture, and Andover's rich historical tradition of outstanding civic architecture dating back to the nineteenth century. A columned entry porch and high-ceilinged public lobby were created toward these objectives. 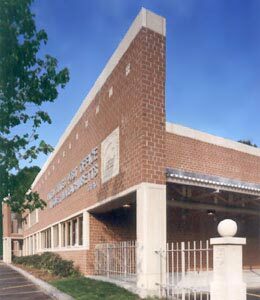 The major materials were brick and stone in keeping with local and Postal Service traditions. Decorative symbols cast into stonework were based on nineteenth century Postal Service designs. The estimated construction cost was $3 million. The final cost of construction was $2.92 million. There were no change orders or extras. The site had significant drawbacks. Half the size of the typical lot required by the USPS program, the site is surrounded with tight physical constraints; a very steep hill, the Shawsheen River, residential neighbors and a public street. The design team determined that the program must be accommodated on two levels, which required underground postal vehicle parking.